Lucknow: With the rising temperature, the scorching sun has the potential to drain us out completely. By ignoring this, we are putting our bodies at high risk. Many feel dehydrated during summer months and experience low energy level. Hence, it is important that we should take extra care during the hot season. From eating right to following certain lifestyle changes, we can beat the hazardous impacts of summer. Here we have listed a few cooling foods that you should definitely add to your diet to fight against the hot climate effects. Watermelon, a seasonal summer fruit comes for a reason. As it contains 91.45 per cent water, it helps in fulfilling your body’s water requirement. Also, loaded with anti-oxidants properties, watermelon gives you a wonderful cooling effect. Loaded with fibre, eating cucumber in summer helps in keeping constipation at bay. Cucumber also contains high amount of water content. So, have this crunchier food and stay cool during the hot weather. Curd is not only delicious but also gives a cooling effect to the body. You can have curd in different variants too. Make spicy buttermilk, or sweet lassi. You can also make raita and can eat it with your food. Another option to eat curd is by adding seasonal fruits in it or by making lip-smacking smoothies. Coconut water is the best summer drink. This ‘not-so-expensive’ drink is available in almost all fruit shops and is loaded with essential vitamins, minerals and other nutrients. It has cooling properties that help you fight against the hot weather. Studies also show that drinking coconut water regularly also protect against cancer. 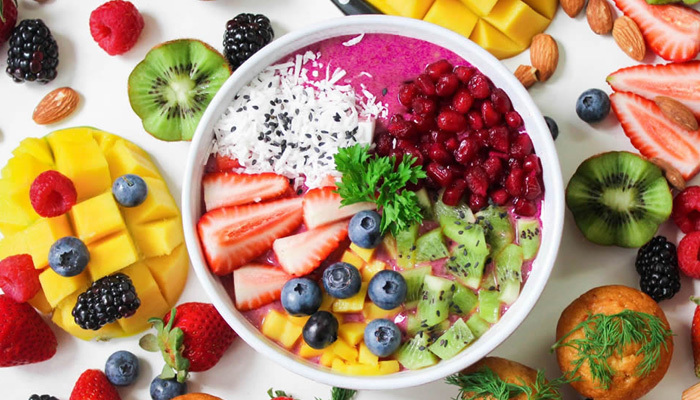 Dive into a bowl of cool and fresh fruits like oranges, berries, kiwi and lots more. Add a pinch of black salt and a cup of any juice of your choice. Sprinkling chaat masala and few drops of lime juice is all that your taste bud needs. Having green leafy vegetables around the year gives you numerous benefits. And adding them to your daily diet is also beneficial as green leafy vegetables contain high amount of water content. Remember, avoid over-cooking these vegetables as it could cause loss of water content in them. Loaded with high amount of water content, it is great to eat melons during summer. They help you in staying hydrated and gives you a cooling and refreshing effect. Lime water, also referred to as nimboo pani is another refreshing drink for summer. A glass of lime water provides many health benefits. You can have sweet limewater, can add salt, a pinch of cumin powder to it to enhance its flavour. Lime water keeps you chilled and refreshed all day long.